It’s been a long long hiatus that I’ve taken. I blame Instagram. Grainy photos behind retro-esque filters and uninspired dishes. In any case, I’m hoping this entry won’t be like the last one – the last one for a long while. So I guess from now, I’ll be using more than a couple of Instagramasised photograph. Fingers crossed that’ll work out well. Alas! The first of the list is Instant Mee Pok! Mee Pok (translated from Chinese dialect as ‘thin noodles’) is a flat egg noodle used a lot in Singapore to make Fishball Noodles and Mushroom Minced Pork Noodles. They say the first creators of pasta were actually the Chinese; Italians apparently discovered it much later. In any case, Mee Pok is usually cooked fresh and unless you buy them fresh from the market or make them yourself, you won’t get a chance to have them this far from East Asia. But, but, BUT! I stumbled upon a pack of dried instant Mee Pok at Chinatown last week. Well, it isn’t quite exactly the same thing as its fresh counterpart, but I’d say it comes pretty damned close. Prepare the mussels, cleaning them of barnacles and beards. 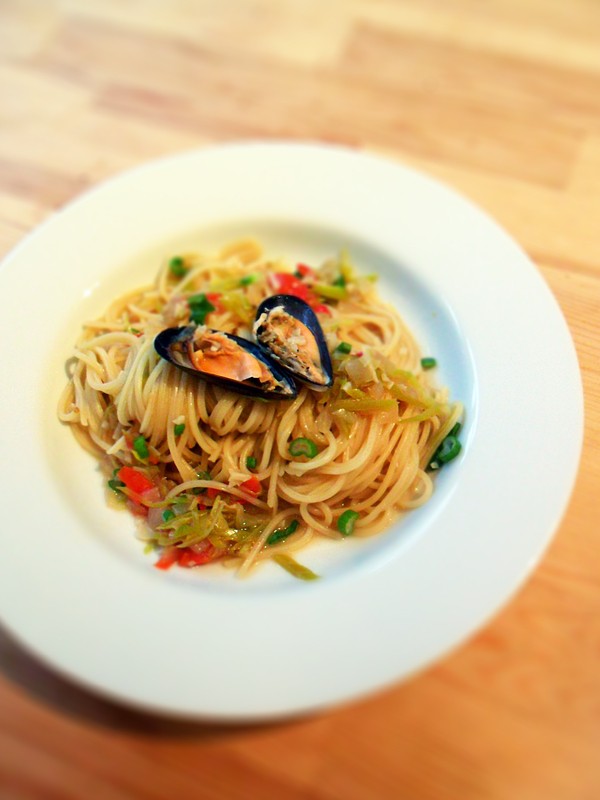 Steam the shellfish with a little bit of water, in a saucepan on medium-low heat. Remove when the mussels as they open and discard those that don’t. Add chopped leeks and tomatoes to the pan and braise slowly. Season with light soy sauce and white pepper powder, to taste. Cook noodles in a separate pot and strain once done. When leeks are beautifully braised to soft tenderness, toss in the noodles and mix well. Serve with the mussels on the side. 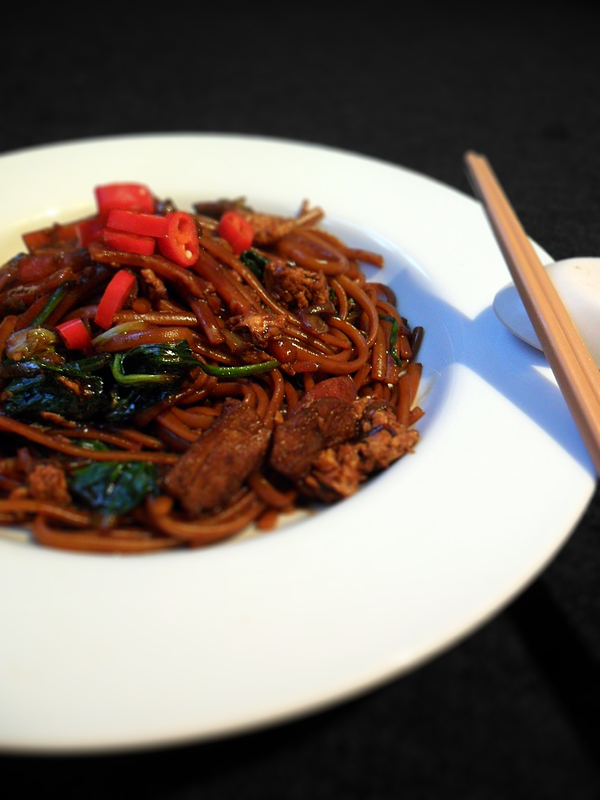 This is the Kuala Lumpur variant of Fried Hokkien Prawn Noodles, similar to the usual Chinese Stir-Fry, but going crazy with the rendered lard and dark soy sauce, the darker the better. Get your noodles, or linguine boiling in a pot and have your ingredients all ready. Drain your noodles or pasta as soon as they’re done. This is important ‘cos stir-frying is a whizz, no time for chopping carrots while your garlic is burning away into a pile of charred lumps. In a screaming hot wok of a tablespoon of oil, get your slices of Chinese sausage, or lardons in. Add minced garlic, minced onion and a slice of ginger into the wok to flavour the oil. Carrots go in ‘cos they take longer to cook through. Once your carrots are almost done, add a small bit of oil and crack in a egg, stirring it about erratically till about done. Then, add in your marinated (minus soy sauce) Melt-In-Your-Mouth Pork, stir-frying it with small quantities of the noodle boiling water. 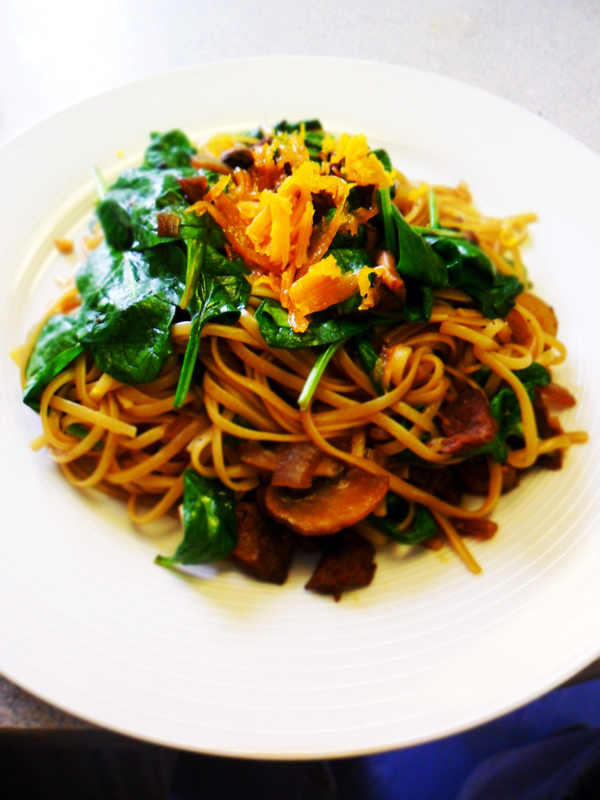 Toss in leafy green vegetables and drained noodles. Season with light soy sauce if necessary. Add a generous pinch of sugar and still happily away. I confess, I am currently obsessed with the ballotine. Rolling meat into a tight bundle and then cooking it makes me happy. It doesn’t help that there is such a sense of excitement when the time is nigh to slice it. Alright, so maybe pork isn’t so appetising in a ballotine. In any case, a drizzle of sesame oil elevates its flavour immensely. 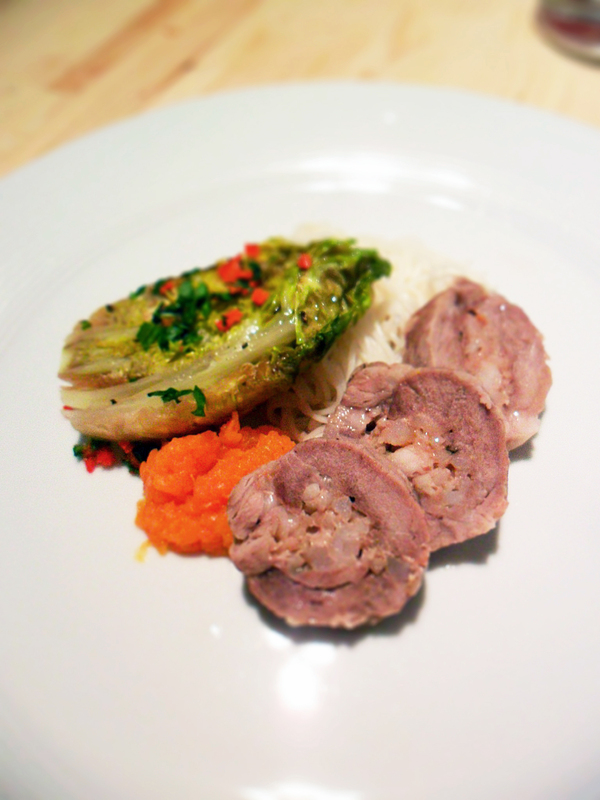 Served with ultra-thin rice noodles, carrot mash and seared lettuce, I am definitely playing with my food. French-style cooking and Asian flavours, at its best. 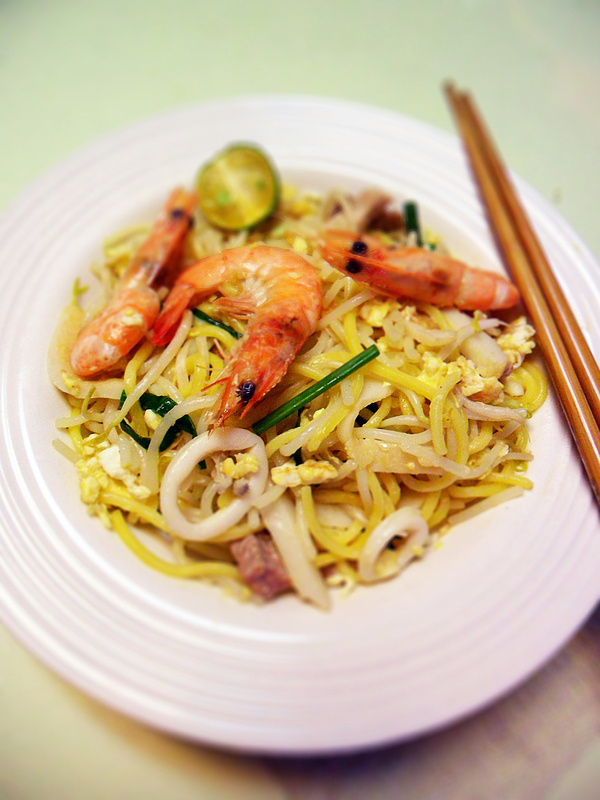 To all those overseas who crave the good ol’ Tze Char Noodles, I’d like to share this recipe with you. It’s not exactly the same as what you’d get for cheap in the neighbourhood restaurant you frequent weekly back in Singapore, but it’ll serve to satisfy your cravings. Get the pasta cooking in a pot. And place a wok on another hob, turned up to full whack. Add the garlic and onion into the wok to flavour the oil. 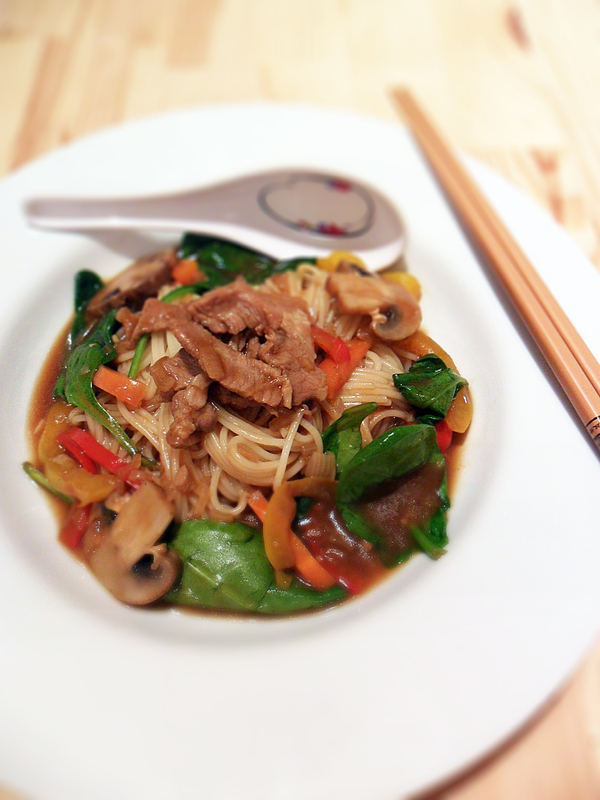 Toss the pork in and add water from the pasta bit by bit, stir-frying till just done. If you’re having mushrooms with this, dump them in now. Add the oyster sauce and grab some pasta water to pour into the wok, till ingredients are almost completely submerged. Mix and watch your gravy form. Turn off the heat and drain your pasta. Get them in, together with the spinach leaves. Toss about till the spaghetti is coated with all the gravy goodness, and till the vegetable leaves have wilted just a little. Serve hot, with Pickled Green Chilli. More on that soon. It’s been a while since I’ve been back to Singapore, and aside from many other things, I miss the food there. I thought I was dealing fine with the abstinence of Singaporean cuisine, until I was reminded of my beloved Fried Hokkien Prawn Mee. My stomach grumbled to the rhythm of the words as they entered my ears. No, I’m not talking about the black sauce variant from Kuala Lumpur. It’s far from anything you’d get in the hawker centres back in Singapore, but it’ll do. Craving, momentarily satisfied. Before you get down to frying the noodles, you gotta have the prawn soup stock ready. Here’s how I did mine. Peel and shell the prawns, then cut the squid into rings. Into a pot, dump the prawn peelings and heads. Also, in goes the peeled prawns, squid and pork belly. Here, I like adding a couple of smashed garlic cloves too. Then fill the pot with boiling water so that there’s just enough to cover what’s inside. Let it boil away before turning it down to a simmer. Season with salt and pepper, so it eventually becomes a peppery and tasty almost-thick sort of soup. Keep a check on the peeled prawns, squid and pork belly. Once they’re just cooked, fish them out. Slice the pork belly thinly and set all aside. In a screaming hot wok, drizzle some oil. This next step is strictly optional. Fry bit of pork lardons and remove when brown and crispy. Leave the rendered fat in the wok. It is liquid gold. Then, in goes an egg. Erratically break and beat it as it cooks. Before the egg gets proper fried, toss in the noodles, both yellow and white. Add a ladle-full of that awesome prawn soup stock you made earlier. This will soften the noodles. Stir till there is no more soup left in the wok. 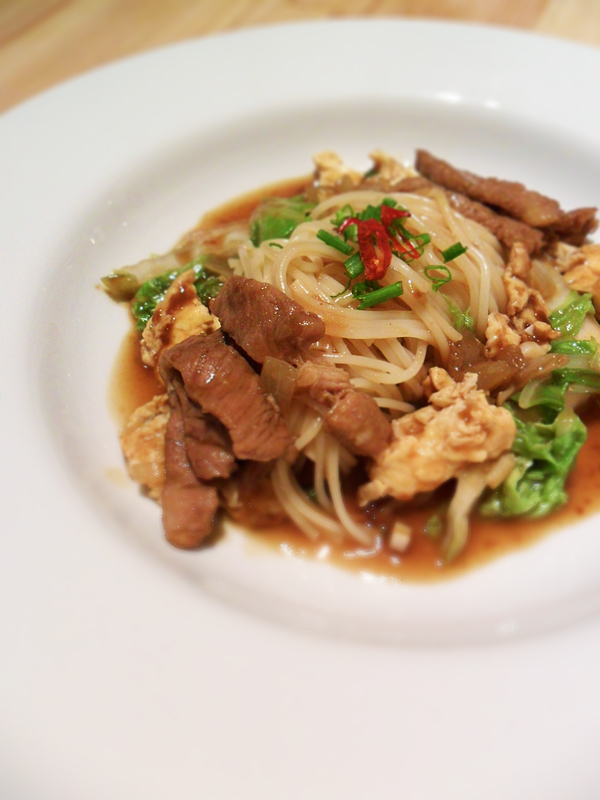 Toss in the beansprouts and stir about. Then, add another ladle-full of the soup stock and cover the wok for at least 20 seconds. This is an extremely important yet understated step. Commonly overlooked, this will allow the noodles to absorb all the goodness from the soup stock. Remove the lid and toss in the cooked prawns, squid and sliced pork belly. Moving everything in the wok aside, make space for a teaspoon of chopped garlic. Fry that till fragrant, before combining with the noodles and all. At this stage, I like to add the bits of crispy fried lard to join the party. Heart-stoppingly extravagant. Add a little more soup stock to wet the noodles. In my opinion, the best of this dish are those that have gravy to slurp at the end. Chives go in, while the fire goes out. Serve with more chives atop, a halved lime and some kickass sambal, which I haven’t tried my hand at making, yet. This time, I substituted with trusty feisty chilli padi. Welcome a couple of Aroma Fairies, then dig in right away. Your stomach cannot wait any longer. For me, I’d like to commend Will Power for allowing me to take a photo before savagely devouring the noodles and all its brilliance. Pork is usually my meat of choice for stir-fry ‘cos for some reason, I think it tastes the most Chinese. Onions, mushrooms, shrimps, egg, spinach, beansprouts, chillies, even cheese is up to you. Whatever makes you happy. Garlic and ginger, almost like the yinyang of Chinese Stir-Fry.